We are a rib family and we love ribs. This recipe for our Ultimate Oven Barbecued Ribs is our favorite and the one we make most often. They take a bit of time to prepare but worth every second. This method is key to delicious, fall of the bone ribs, every time. Preheat your oven to 300 degrees. Prepare a rimmed baking sheet with tinfoil and set aside. Add brown sugar, paprika, garlic powder, hickory smoke salt and crushed red pepper flakes in a medium sized bowl. Stir to combine and set aside. Now to peel off the tough membrane that covers the bony side of the ribs. I start at one end of the rack and I scrape on one of the bones at or near the end. As the skin lifts I shove my finger underneath. As the skin lifts up more you pull it towards the other end of the rack. Almost like pulling off a band aid, very, very slowly. Throw the membrane away. I find it easier to cut my rib racks in half to cook them. It is up to you. Next, I use heavy duty tinfoil if I have it, but if not I just double up. Tear enough tinfoil to wrap each rack, almost like a loose present. To give you an idea about the size of the tinfoil pieces you should be tearing I will explain. The rib section will be placed in the middle of each piece of tinfoil. Both edges or ends of the tinfoil will be brought together above the rack and crimped and rolled tightly, sealing all of the edges. The sealed edge should be facing up. The idea is to leave some air or space above the rack. You do not want the tinfoil tightly wrapped around each section of ribs. I rip all of the tinfoil first, before applying the rub. I find it too messy otherwise. If I am using heavy duty foil only one piece per rack and if not tear 2 pieces per rack. If your work surface is big enough lay out each piece of tinfoil individually and place each rack or half rack on each piece of tinfoil. Apply rub to the ribs on both sides. Lay ribs on one or two layers of foil, shiny side out and meaty side down. Divide extra rub amongst the ribs. Wrap each of them up and place on your prepared baking sheet. Check the ribs at about 2 hours to see if the rib meat is starting to shrink away from the ends of the bone. You may need up to 30 minutes longer. Remove from oven, remove tin foil and place back on the baking sheet bony side up. Set your oven temperature to broil. Brush on your favorite barbecue sauce. Place in oven for 2-4 minutes. 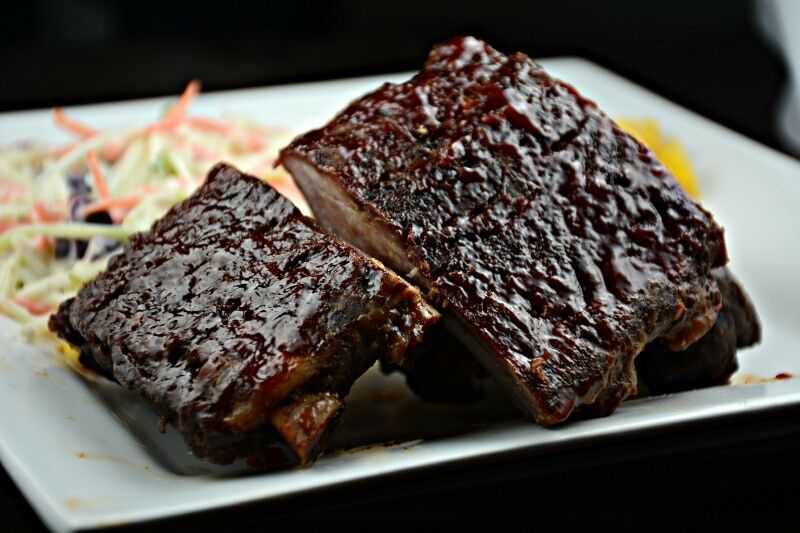 You will notice tiny bubbles on the rib surface as the sauce caramelizes and hardens. Next flip the ribs over so the meaty side is facing up. Brush on barbecue sauce. Broil for 2-4 minutes until sauce on the rib surface is bubbly. If you have time, brush on more barbecue sauce to the meaty side and broil until sauce is bubbly again. Serve immediately and enjoy!